Canarium ovatum, commonly known as pili is a species of tropical tree belonging to the genus Canarium. It is one of approximately 600 species in the family Burseraceae. Pili are native to maritime Southeast Asia, Papua New Guinea, and Northern Australia. They are commercially cultivated in the Philippines for their edible nuts. Although they are grown as ornamental trees in many areas of the Old World tropics of Indonesia, Malaysia and the Philippines, only the Philippines produces and processes pili nuts commercially. Production centers are located on Tablas Island and in the Bicol region, provinces of Sorsogon, Albay, and Camarines Sur, southern Tagalog, and eastern Visaya. There is no commercial planting of this crop, fruits are collected from natural stands in the mountains near these provinces. In 1977, the Philippines exported approximately 3.8 t of pili preparation to Guam and Australia. The most important product from pili is the kernel. When raw, it resembles the flavor of roasted pumpkin seed, and when roasted, its mild, nutty flavor and tender-crispy texture is thought by some to be superior to that of the almond. In Indonesia, especially in Minahasa and Moluccas islands, the kernels are used for making cake, bobengka in Minahasan or bubengka in Maluku. Pili kernel is also used in chocolate, ice cream, and baked goods. The largest buyers of pili nuts are in Hong Kong and Taiwan, the kernel is one of the major ingredients in one type of the famous Chinese festive desserts known as the "moon cake". Nutritionally, the kernel is high in manganese, calcium, phosphorus, and potassium, and rich in fats and protein. It yields a light yellowish oil, mainly of glycerides of oleic (44.4 to 59.6%) and palmitic acids (32.6 to 38.2%). The young shoots and the fruit pulp are edible. The shoots are used in salads, and the pulp is eaten after it is boiled and seasoned. Boiled pili pulp resembles the sweet potato in texture, it is oily (about 12%) and is considered to have food value similar to the avocado. Pulp oil can be extracted and used for cooking or as a substitute for cotton seed oil in the manufacture of soap and edible products. The stony shells are excellent as fuel or as porous, inert growth medium for orchids and anthurium. 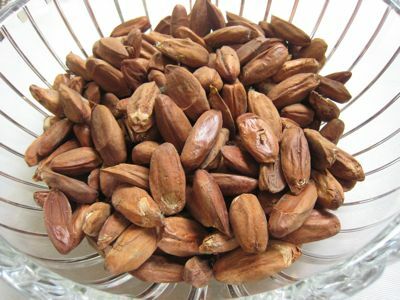 Recipes using Pili Nut see Here and Here.